Each process begins with getting a learner's permit or examination permit. Applying for a New License (Teen Drivers). Applying For a New License (Drivers 18+). If you are younger than 21 years old and have an out-of-state driver's license, you cannot transfer your license to New Jersey. You must first satisfy the requirements of the GDL program to apply for your NJ driver's license. Continue reading below to get information about the type of NJ learner's permit you will need. Student learner's permit: Eligible at 16 years old. Examination permit: Eligible at 17 years old. You will be eligible for your probationary driver's license after holding your examination permit for 6 months (3 months if you are 21 years old or older). Your driver's permit will be valid for 2 years at a time. If you let it expire, you will need to apply for it following the same steps outlined below. All GDL drivers (learners permit, examination permit, probationary license) must display a red reflectorized decal on the upper left corner of each license plate (front and back). Failing to abide by this rule will result in a $100 fine. Each stage of the GDL program comes with specific driving restrictions. You will be fined $100 if caught violating any of the above driving restrictions. The restrictions are explained in each section below. Pass a knowledge (written) test or present a submit blue high school test waiver if you passed the test at school. Present a primary ID and your Social Security number. 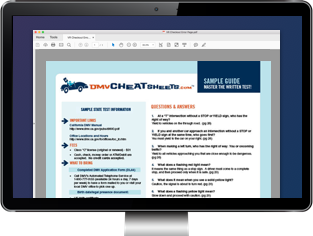 Show proof of enrollment in a driver's education course. Have a signed letter of consent from your parents or legal guardian. Pay the $10 student permit fee. Your course instructor must purchase the permit. Once you complete the minimum 6 hours of drivers training, you may return to your local MVC office to validate your permit and schedule your road test. You must be accompanied in the front seat by a NJ-licensed driver who is at least 21 years old and has at least 3 years of driving experience. You may NOT drive between the hours of 11:01 p.m. and 5 a.m.
You may only have 1 passenger from another household in the vehicle while you are driving, unless accompanied by your parent or guardian. You are allowed to transport parents, guardians, and dependents. No use of any electronic device while driving, including cell phone or video games. Seat belts must be worn at all times. You must hold this permit in good standing for a minimum of 6 months before graduating to the next level. This learner's permit is valid for 2 years. Have a completed Auto Permit Application (Form BA-412C). This form is only available at the MVC. Pass a knowledge (written) test. Present a required proof of the 6 Point ID verification. Pay the $10 examination permit fee. Your permit will be valid for 2 years. The permit will be validated so you can practice driving with a supervisor. You will need for at least 6 months and be 17 years old before you are eligible for your probationary driver's license. You can only drive while accompanied by a licensed New Jersey driver at least 21 years old who has held a valid driver's license for at least 3 years. This supervisor must ride in the front seat beside you while you drive. Exemption can be made for for employment or religious reasons. You will be required to carry documentation on letterhead signed by the employer, organization or religious institution that state the request. This documentation my have the official's signature, title, address and phone number. You may only have 1 passenger from another household in the vehicle while you are driving, unless you're accompanied by your parent or guardian. You are permitted to transport parents, guardians or dependents. You must have a reflectorized decal on both the front and rear license plate. Pass a knowledge (written)/permit test. Present a proof of your 6 Point ID verification. The permit will be validated so you can begin practice driving. You must be accompanied by a driver with a New Jersey driver's license who is at least 21 years old and has held a valid driver's license for at least 3 years. This supervisor must ride on the front seat beside you while you drive. You must hold your New Jersey learner's permit a minimum of 3 months. The permit test in New Jersey has 50 questions. You must get at least 80% correct to pass. The MVC recommends studying the MVC Driver's Manual and they also offer a basic practice test. Our suggestion is to prepare with one of these industry-leading online practice tests. They are offered by our approved partner and they have been created for your success. When you're ready, visit your local NJ MVC driver testing center and take your written permit test. See "Applying For Your NJ Learner's Permit" above for more details. If you have a student learner's permit, you must complete at least 6 hours of driver's training through your Driver's Ed course before the NJ MVC will validate your permit. Once you've finished this step of the process, you may begin your supervised driving practice. Student learner's permit (early bird) minimum age 16 years old: At least 6 months. Examination permit (young adult) minimum age 17 years old: At least 6 months. Examination learner's permit (adult) minimum age 21 years old: At least 3 months. Finish your supervised driving for the required period of time. You must hold your probationary driver's license for at least 1 year before applying for your basic driver's license in New Jersey. This applies to all drivers regardless of age. For information on how to get your basic driver's license, please read our page about Applying for a New License in New Jersey (Teen Drivers).